The retired natural foods importer and distributer eclipsed Joe King as the oldest competitor to ever win the event, the second oldest foot race in America behind the Boston Marathon. 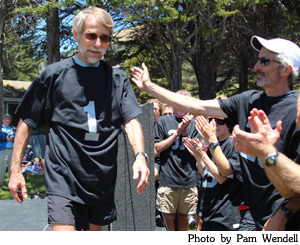 King won the Dipsea in 1996 for the second year in a row at the age of 70. Schmid, who finished second last year in the Dipsea, ran 46 seconds faster this year and helped his club team, the Tamalpa Runners, win the Team Trophy for the 34th time in the last 35 years. Schmid warded off a strong effort by Lundy, who clocked the fastest time (57:38) by a female in the field. "I tried to catch him all the way down from Cardiac (the highest point on the course at 1,300 feet above sea level)," Lundy said. "It shows what a great race Hans ran today." Diana Fitzpatrick, 54, of Larkspur placed third, her highest finisher ever in the Dipsea, and 26-year-old Alex Varner came in fourth again, yet became the first runner in Dipsea history to win the best time award for the fourth consecutive year. His time was 49:01. "This is the best I can do," said Varner, who missed six weeks of training with a foot injury. "When I go into it, everything has got to go wrong with everybody else and incredibly right for me to win this thing." Varner was a scratch runner with no head start in the event which awards head starts to runners based on age and gender. He had to pass more than 400 runners in the tight and treacherous course just to capture fourth place. Brian Pilcher, the 2010 Dipsea champion from Ross, finished fifth and defending champion Jamie Rivers, 61, of Mill Valley placed 10th, one spot ahead of 16-year-old Julia Maxwell of Ross who was the first high school runner to finish in the field. Trevor Reinhart, 16, of Ross was the first boy high school finisher at 41st. Julian Lepelch, an 11-year-old from Mill Valley, took 15th place and, with his 49-year-old father Patrick who finished 26th, claimed the Alan Beardall Family Trophy. They also received black numbered T-shirts for finishing in the top 35 as did 65-year-old Keith Krieger of Santa Rosa, who said he had been trying for 49 years to win his first coveted Dipsea T-shirt. The starting field consisted of 1,500 runners ranging in ages from six (Brendan King of Mill Valley) to 86 (Roy Harvey of Medford, Ore.) representing 26 different states and three foreign countries. Most were attracted to entering the Dipsea because of its addictive nature. "I love the Dipsea because I love to hate the Dipsea," cracked Samantha Emory, who received a scholarship from the Dipsea Race Foundation on Friday night minutes after receiving her diploma in ceremonies at Tamalpais High School in Mill Valley. On the 10th anniversary of Jack Kirk's final start and finish in the Dipsea at the age of 95, 67-year-old Don Madronich of Sebastopol, competing in his 45th Dipsea, won Kirk's "Dipsea Demon" award for dedication, perseverance and performance over time. Longtime Dipsea race handicapper Jim Weil of Mill Valley was awarded the Red Tail Hawk Award (Jerry Hauke Perpetual Award) for leadership, dedication and sportsmanship and Dave Lampert of Novato was the recepient of the Norman Bright Award for extraordinary effort in the Dipsea race.